Pruett, C. L., S. E. Henke, S. M. Tanksley, M. F. Small, K. M. Hogan, and J. Roberson. 2000. Mitochondrial DNA and morphological variation of White-winged Doves in Texas. Condor 102(4):871-880. Schwertner, T. W., H. A. Mathewson, J. A. Roberson, M. Small, and G. L. Waggerman. 2002. White-winged Dove (Zenaida asiatica). In The Birds of North America, No. 710 (A. Poole and F. Gill, eds.). The Birds of North America, Inc., Philadelphia, PA.
Wolf, B. O. and C. M. del Rio. 2000. 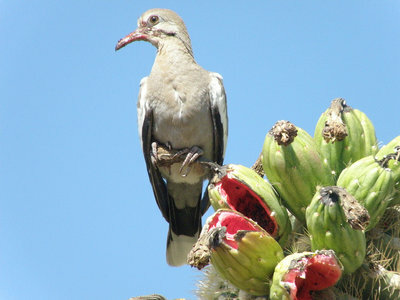 Use of saguaro fruit by white-winged doves: isotopic evidence of a tight ecological association. Oecologia 124(4):536-543. 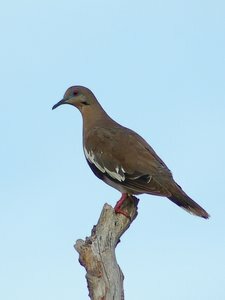 All About Birds: White-winged Dove. Cornell Lab of Ornithology. White-winged dove Zenaida asiatica. USGS Patuxent Bird Identification Infocenter. Page: Tree of Life Zenaida asiatica. White-winged Dove. The TEXT of this page is licensed under the Creative Commons Attribution-NonCommercial License - Version 3.0. Note that images and other media featured on this page are each governed by their own license, and they may or may not be available for reuse. Click on an image or a media link to access the media data window, which provides the relevant licensing information. For the general terms and conditions of ToL material reuse and redistribution, please see the Tree of Life Copyright Policies.